Mercedes-Benz traces its roots to 1926 when the brand produced the first gasoline-powered car. With this illustrious beginning, the brand soon became known for its unfailing quality. However, even these great cars need Mercedes Benz Repair in Arizona once in a while. 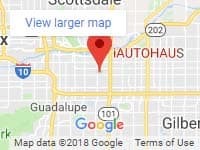 If you’re looking for a great mechanic in Tempe, AZ that specializes in Mercedes repairs, come to iAUTOHAUS! We guarantee quality workmanship and prompt, courteous and knowledgeable service with every visit. Check out our current specials going on now or call 480-317-0783 today to book your Mercedes-Benz Factory-Scheduled Maintenance online. Owners of Mercedes-Benz autos can rely on iAUTOHAUS to service their European luxury vehicles for any need that may arise. iAUTOHAUS has years of experience repairing high-end vehicles and only employs factory trained technicians who perform excellent work at an affordable price point. We are confident that once you bring your Mercedes-Benz to us you will understand what personal concierge-style service really means. Our professional service-repair-care team is here to strive for the highest quality Mercedes-Benz service in Arizona. When considering a service partner to care for your Mercedes-Benz, iAUTOHAUS is a prudent solution. Contact iAUTOHAUS to schedule your Mercedes-Benz repair service in Arizona today! Give us a call at 480-317-0783. Rest assured that the iAUTOHAUS BOSCH Authorized Service and Repair Center is stocked and ready to be the one-stop-shop for all your Mercedes-Benz repair and luxury automotive needs. We know how to pamper your baby with Reliable Independent Mercedes-Benz Service, and our BOSCH Authorized Service Center boasts only the latest, high-tech factory equipment to service luxury cars from grill to tailpipe using only factory or OEM replacement parts. Although it’s true that we have affordable prices, our family-owned BOSCH Authorized Service Facility has something even more valuable to offer. Here are a few more reasons to choose iAUTOHAUS for your Mercedes Benz repair needs in Arizona. Our highly trained and certified technicians are chosen because they’re the top of their field. We’re so confident in our highly trained technicians that we place a 24 month/24,000 mile warranty on our Mercedes Benz service and repair in Tempe, AZ. To help you live up to the image of the brand, we provide a complimentary car wash and vacuum once we finish your Mercedes repair. We offer a FREE shuttle service so that you can relax at home while we complete the work. If you need a little more help than that, we’ll be happy to provide FREE towing to our Mercedes Benz Repair center in Tempe, Arizona. Ask us about our discounted car rental or enjoy the clean, comfortable waiting area with WiFi and a flat-screen TV. Trust iAUTOHAUS to help you out with unexpected repairs on your luxury European Mercedes Benz vehicle. Simply apply for a 0% interest OAC financing for 6 months with a BOSCH Service Credit Card. Look out for monthly service specials to save even more. We can take care of your Mercedes-Benz factory scheduled maintenance. If you’re not sure what’s due, we’ll look it up and explain what needs to be done and why. All these vehicles require service at 10,000 miles or 1-year and 20,000 miles or 2-year intervals. Below is a basic maintenance guide. The actual service may vary based on the car’s actual maintenance history. Some service recommended are based on the mileage. Would you like a more convenient way to service and repair your Mercedes-Benz luxury automobile other than the dealership? iAUTOHAUS is your solution! For any and all service related issues with your Mercedes-Benz car, we can help! If your Mercedes-Benz is experiencing issues, we can get you fixed up right the first time and back on the road quickly. Schedule a Mercedes-Benz repair in Tempe, AZ at iAUTOHAUS today. Call 480-317-0783 or book your Mercedes-Benz repair online. At iAUTOHAUS we are always on the lookout for European luxury vehicles in excellent condition. You will receive a fair offer and that quote will be good for 7 days. Perhaps you would like to use your vehicle as a trade-in? Even better. Looking for a great Certified Pre-Owned luxury car? We have some terrific inventory at a great value for you to select from. New inventory arrives every week. Give us a call today to get started!